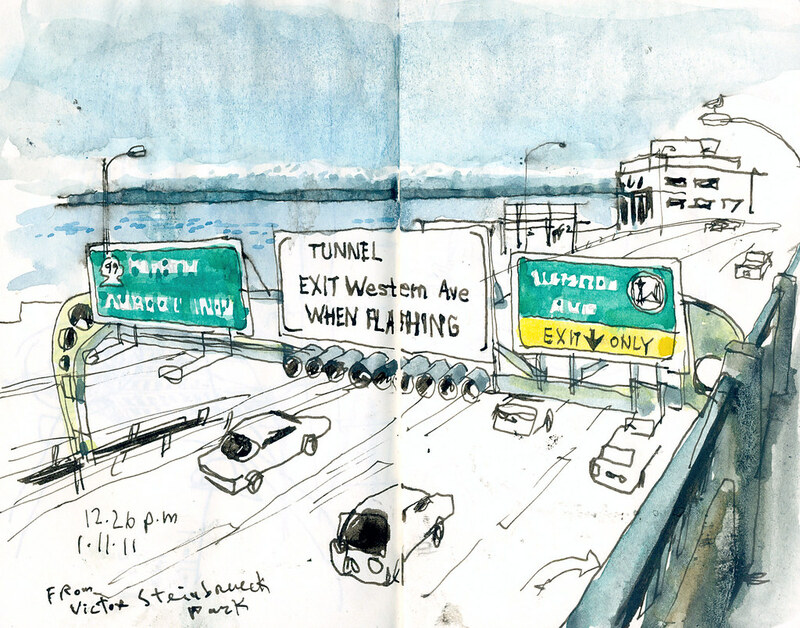 Sketched Jan. 11, 12:26 p.m., from Victor Steinbrueck Park. I’m looking to sketch some views around the viaduct before it’s gone. I saw it for the first time in 1995 during a weekend visit to Seattle when I lived in Reno, Nevada, where I worked for the local newspaper as a graphic artist, my first job in the United States after crossing the Atlantic all the way from Spain. Who knew I would end up moving here 11 years later! I don’t drive through the viaduct or have any more interesting personal stories about it, but I wonder if you do. Did your car ever break down here? Were you driving through it during the 2001 Nisqually quake? Do you live nearby? Do you remember when it was being built or when it opened in 1953? I bet every Seattleite has some viaduct story or memory to share. Soon, that’s all we will have left of it.